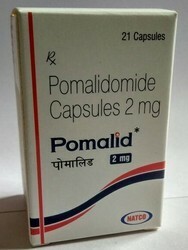 Providing you the best range of pomalid 2 mg with effective & timely delivery. Results from a randomized phase III trial show that the combination of pomalidomide (Pomalyst®) and low-dose dexamethasone may benefit some patients with multiple myeloma that has worsened (progressed) despite other treatments. Patients who received the combination therapy lived longer without the disease progressing (progression-free survival) than patients who received high-dose dexamethasone alone. Overall survival was also improved in the group that received the combination therapy compared with the other group.